Sausage-shaped party balloons are used to secure the self-assembly furniture and toys designed by Kingston University graduate Fern Toynton. Each Inflate kit comes with a series of beechwood slats with holes cut through them. 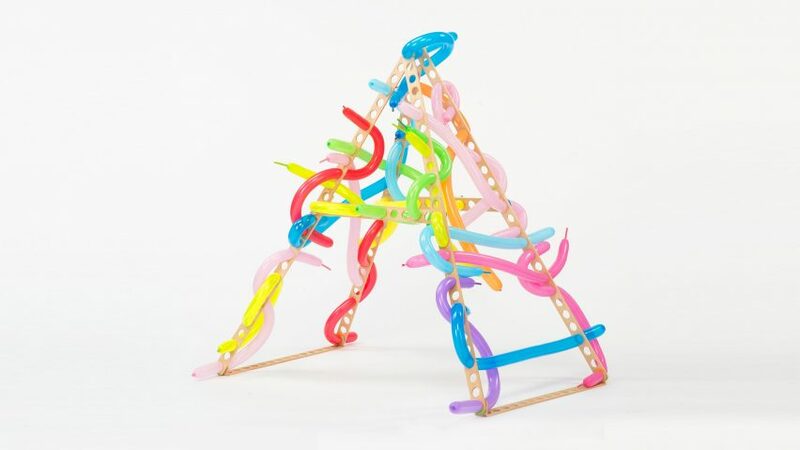 The pieces are made to be held together with colourful modelling balloons, which are inflated through the holes to create flexible joints without the need for nails or screws. "If you inflate something through a hole it creates a joint because it inflates on both sides, making it difficult to pull out or remove the inflated piece," Toynton explained. Toynton, who graduated from Kingston's product and furniture design course, wanted the items to be playful – both during the assembly process and when they're finished. "It was crucial for the product to reflect the playful nature of the process, so I made it literally playful as a children's building toy," she told Dezeen. "When I trialled this toy with a group of children, their grandmother stated that it was the first toy which all of them enjoyed to play with together as all found it equally as engaging." 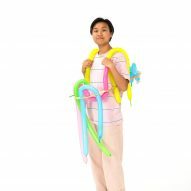 The Inflate kit is accompanied by an instruction manual. It gives users suggestions of what they can make – including types of furniture that are not load-bearing – but Toynton notes that the aim of Inflate is to encourage creativity and exploration. "The toy requires more than one person to build it," she added. "This encourages teamwork in a time where children spend a lot of time on electronic devices." "The holes also mean the pieces can be attached to other things around the children, such as chair legs or door handles." 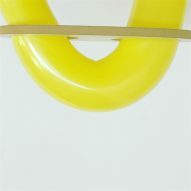 The shapes of party balloons also influenced Dutch designer Marten Baas' collection of hand-blown glass pendant lamps, while South Korean designer Seung Jin Yang coated brightly coloured balloons in resin to create inflated seats. Children's furniture has been a growing product category in recent years. 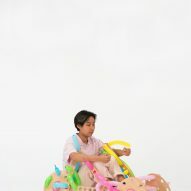 In 2016, Swiss studio Big-Game introduced the Little Big Chair, which can be adjusted as kids grow, while Dutch brand Teehee explored a similar concept with the Illa and Illeta furniture.